Is it just me or does the world seem a little unstable right now? Given the tsunami in Japan and subsequent Fukushima nuclear disaster, inflation in the United States and unemployment rates globally, stocking up on essentials doesn’t seem like such a bad idea. I personally have purchased a Katadyn water filter along with several packs of Pro Bars just to stay on the safe side. Regardless of earthquakes or other issues that might come up, these are handy things to have around. I use the water filter on backpacking trips occasionally and eat the bars as healthy snacks here and there between meals. As my supply gets low I just grab a few more bars and that keeps the whole stock fairly fresh. In addition to the filter and bars I’ve also got a standard first aid pack that includes basic medicines and water treatment items. First aid kit with basic medicines, bandages and water purification elements. If you can’t keep food and water in your stomach because you got sick then what’s the use? Basic water and bars are good but recently I found out about a few different companies that produces outdoor camping style food packs along with emergency food buckets for easy storage and long term use. This kind of thing will definitely put you and your family in a better place than granola bars. 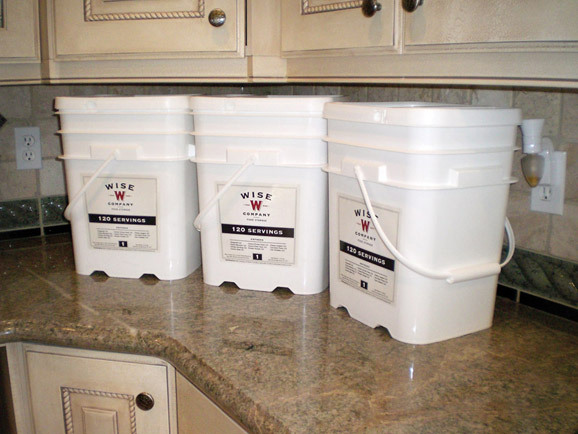 Emergency food storage kits are designed to deliver all of the nutrients necessary to keep you alive in the case of a prolonged food shortage and be compact enough to fit into a closet. The best part is, they last for up to 25 years! These kits are offered by a range of companies including Wise Foods and Mountain House and have become so popular in recent months that they are temporarily sold out! For good prices check out H1KER.com and in the mean time consider your best short term options. Get that water filter and definitely a first aid kit, consider buying granola bars in bulk and if the electricity goes out put some cellophane into the drain in your tub and fill it up with water. This will only work for a limited time while pressure is up but it could be the difference between having to use that water filter in a river outside verses having a clean supply right at home. Maybe the best thing anyone can do to prepare themselves for a food or water shortage is to to stay healthy and active. Get regular exercise and keep your body in shape. Older people and kids are at the most risk in emergency situations but a healthy kid or senior has a lot better chance than an unhealthy one. This entry was posted on Thursday, April 14th, 2011 at 12:27 am.